The best testimony I can give about the Maker’s Tool Works (MTW) Create Express printer is since receiving it over two months ago, I have been running it constantly day and night. Besides having it printing while I do my normal work, before going to bed I put on one of the longer prints to run at night. 3D printers for the hobbyist are one of the truly great things to happen in the last few years. 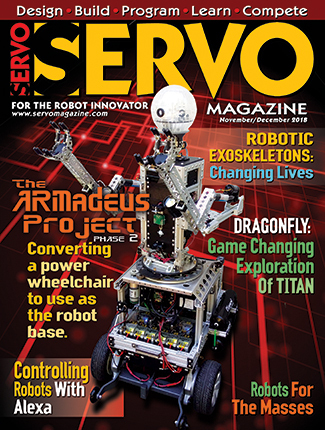 My main interest is in robotics, and 3D printing is the perfect tool for this. It’s so much easier to design a part in a CAD program and print it out rather than hand fabricating it. Literally, your only limitation is your imagination! 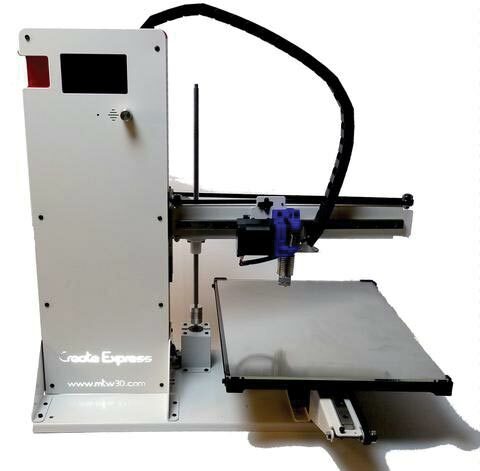 The Create Express is an easy printer to assemble and use. So much of the hardships of setting up a printer are already worked out for you. I also found it to have far fewer software problems than other printers. I use this printer mostly for robot parts, but the range of things you can do with one is limitless. 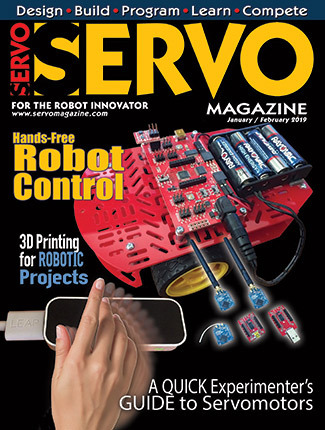 One of the popular websites for 3D printing is Thingiverse. There are hundreds of pre-designed items for download in the form of .stl files which is a file with a “sliced” design in it. 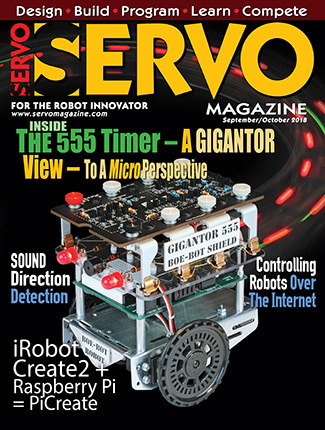 Among the many projects I have downloaded or designed are sensor holders for robots, a whole walking robot, quadcopter propeller guards, spring-loaded windup cars, tool holding cups, and Metropolis’ Maria robot. 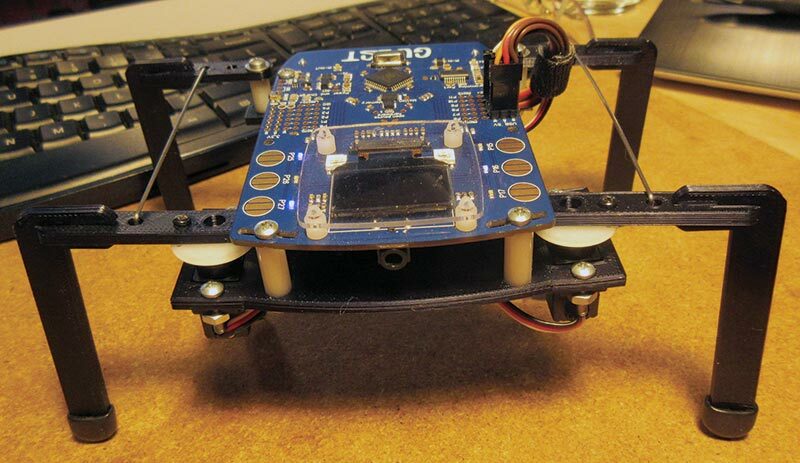 A walking bug robot body. 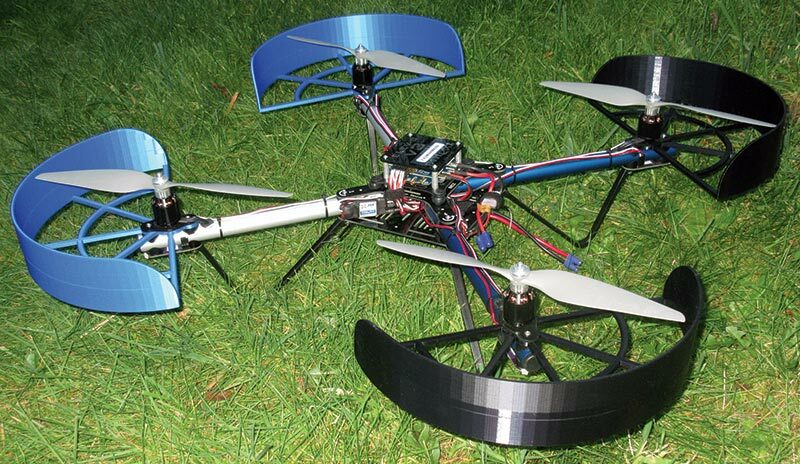 Propeller guards for large Parallax ELEV-8 drone. 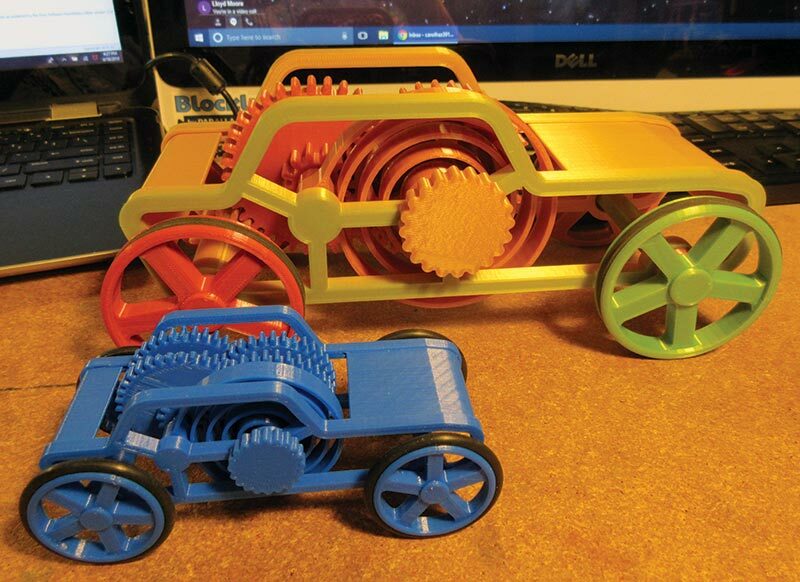 A double-sized print of wind-up car using variegated PLA filament. Most designs for a 3D printer start with a part drawn in a CAD program. There are many CAD programs on the market — most of which are very expensive and made for professional designers and engineers. 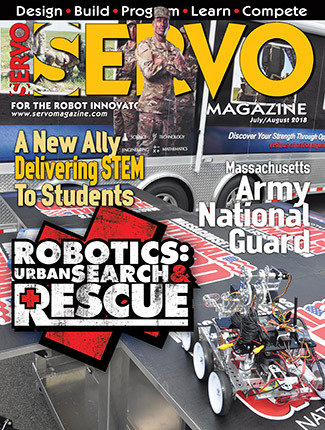 Some companies offer less expensive or free versions to students or hobbyists. There is also a lot of freeware on the Internet for both graphical and command line CADs. Most of these are open source. 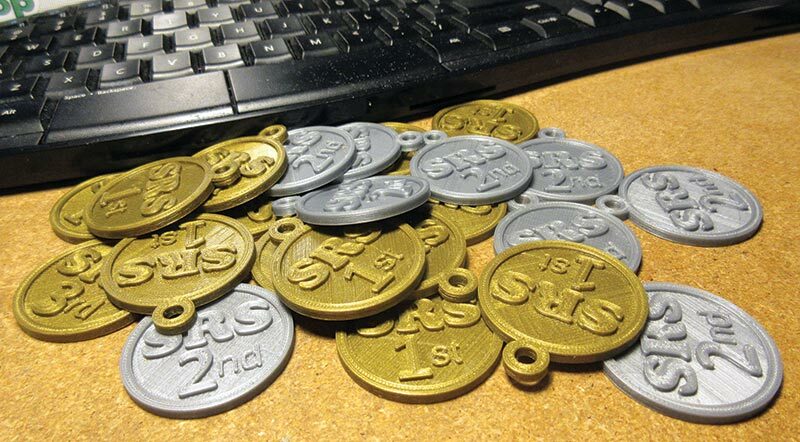 I use OpenSCAD which is both free and open source, but has a bit of a learning curve to it. 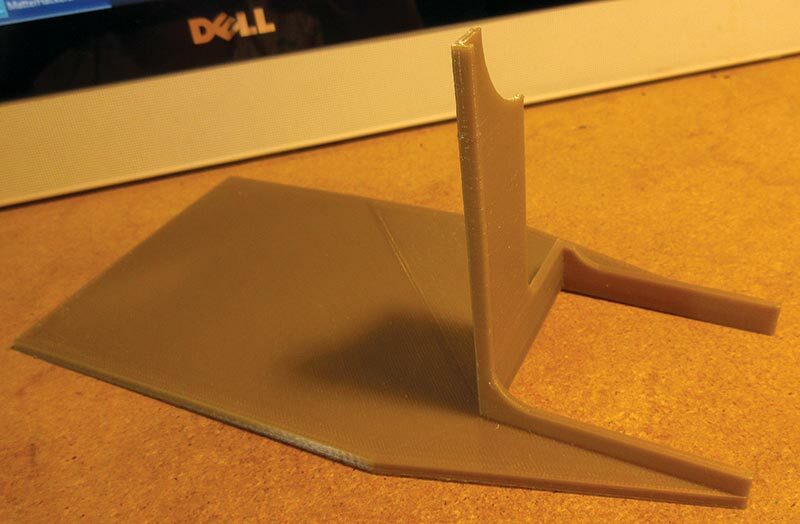 After designing a part, it’s then put in a slicing program to prepare it for printing. The slicing program turns the part into individual layers for printing. The resulting .stl file is loaded into the software which runs your printer. Almost all CAD programs will generate an .stl file, but there are also freestanding slicer programs such as Slic3r and Cura. The next step in the software chain is to load your .stl file into a program that will generate G-code to control your printer. Again, there are a lot to choose from. One of the popular programs is called Pronterface or Printrun. It’s free and open source. MTW printers come with a software package called MatterControl which is from MatterHackers. It has its own slicer called MatterSlice which is nice because you don’t have to switch between programs to work on a part. You do have the option of using other slicers with it, however. Both Maker’s Tool Works and MatterHackers supply a lot of documentation for the software. The hardest part of 3D printing — at least for me — is setting up the firmware for the printer and doing the many adjustments to make one run smoothly and accurately. It took me a long time to set up a printer kit I bought 10 years ago (it had no documentation and was virtually scratch built). 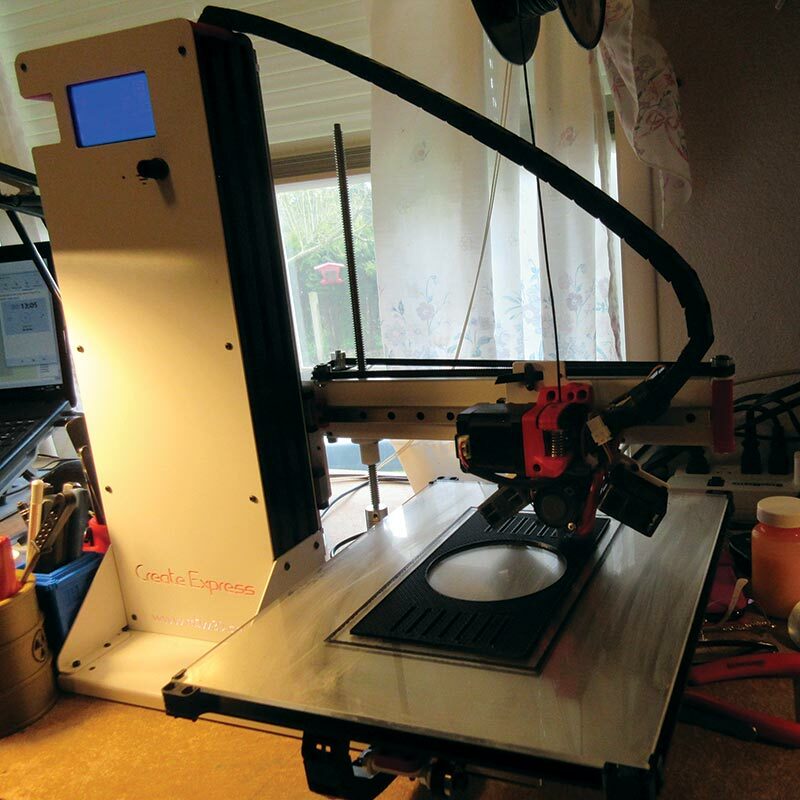 With the MTW Create Express, once I put the kit together the printer was virtually plug-and-play. I love the large print area! It might look a little smaller in the photos, and it does have a smaller footprint than some older printers, but the print area is maximized to the bed so there’s a lot of height available. The print area is 250 x 315 x 250 mm. PSU lid on printer shows large size of print area. I created a set of quadcopter propeller guards designed in OpenSCAD that took up the entire bed and printed beautifully. 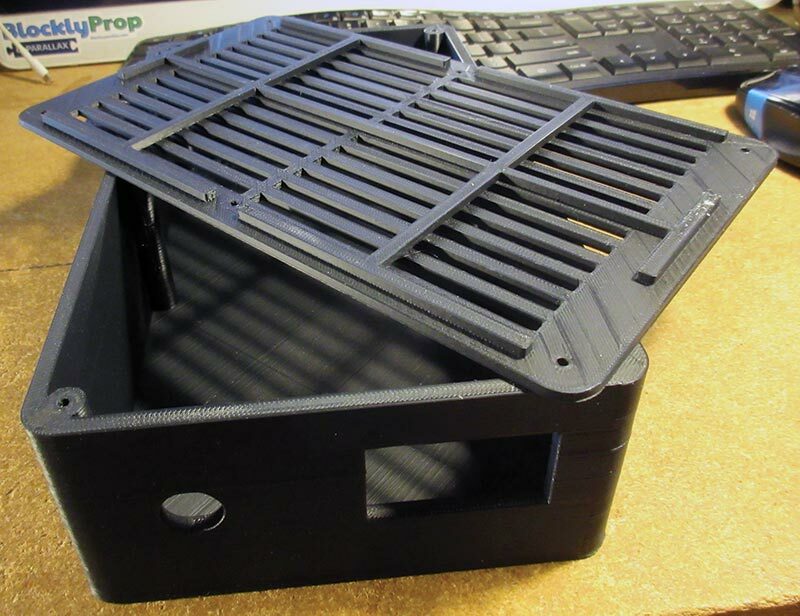 One of the reasons for getting such a good print over the entire bed is the auto bed leveling unit from ANTCLABS called a BLTouch which comes with the printer. Mine also came with an E3D-V6 hot end and a direct drive extruder. Instead of steel rods, the printer uses recirculating ball linear rails to move the printing axes, so it runs very quietly. The only thing you hear when it runs are the fans. For the brains, it has the Einsy Rambo 3D printer controller and Trinamic stepper drivers for high precision and quiet operation. A pre-configured version of Marlin firmware is provided by Maker’s Tool Works for the printer. I found I didn’t need to tweak it, so it ran right away. The graphic LCD card has SD card support and the Create Express can also be upgraded to run wirelessly from your web browser, smartphone, or tablet over Wi-Fi with the MTW Standalone Printing Upgrade or a user supplied Raspberry Pi. Maker’s Tool Works provides several different avenues for support and help in assembling and tuning up your printer. On the website (makerstoolworks.com), there is full documentation on the assembly and software for your printer and a link to live chat which I found to be a quick and easy way to ask questions. The MTW Facebook page is another way to post questions or to show off your creations and see what others are doing. The MatterControl software has a lot of documentation on its website (matterhackers.com) and a link to their blog where you can ask questions. MatterHackers also has a Facebook page. I had very few problems assembling this printer. The only real issues were sometimes needing thinner fingers and a third hand. If it got too fiddly, I went on the live chat and somebody always had an easier way or a little trick to help. I really like this printer (as you can probably tell). Besides doing a wonderful job of printing and being easy to adjust between different print qualities, it’s also pretty to look at! Like I said earlier, I have mine running almost constantly day and night, and so far, have had no failures or hiccups. (Well, except for those power outages from a windstorm and Windows 10 deciding to upgrade and restart in the middle of the night.) I sometimes bring the printer to the Seattle Robotics Society meetings. Box for 12V power supply unit. 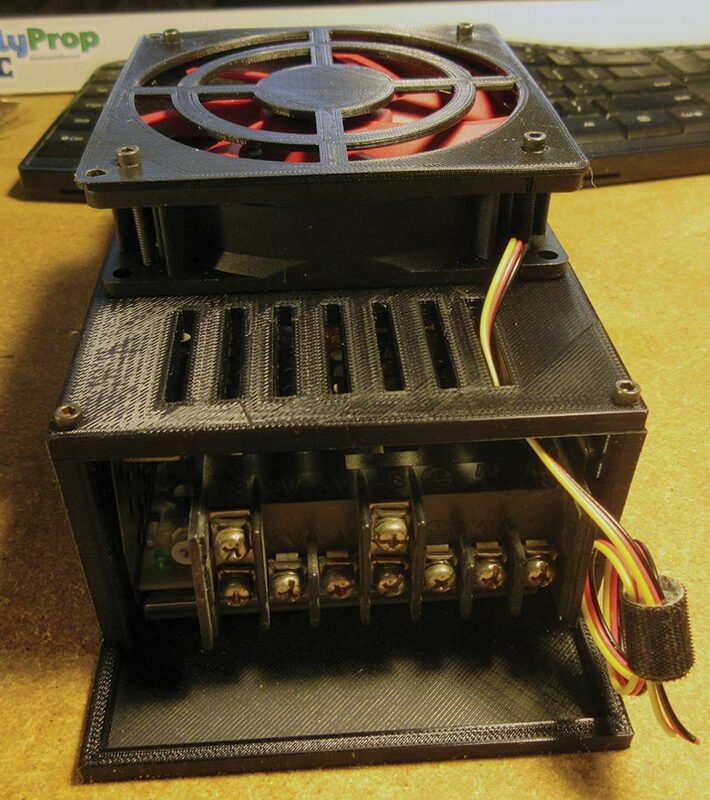 Small PSU box with fan cage. Sun shade for solar telescope. 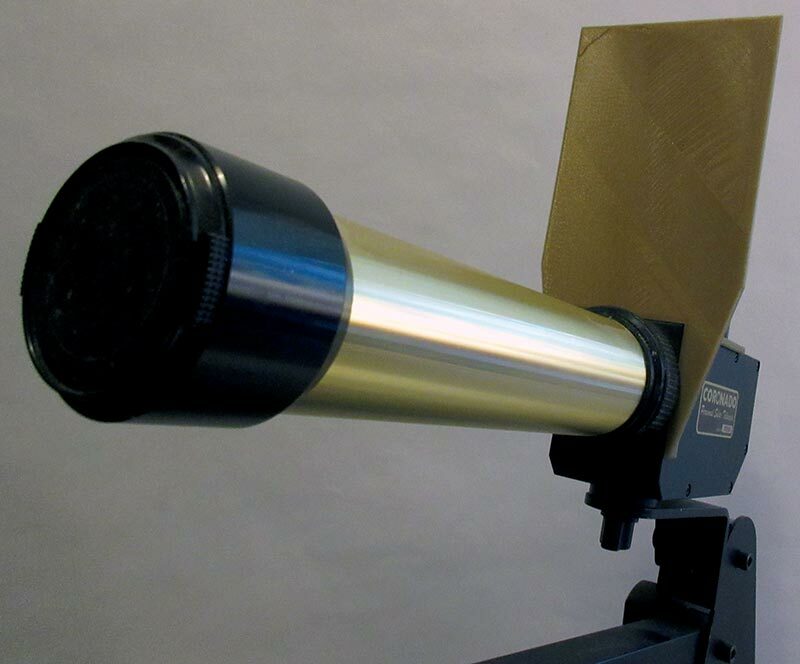 Shade mounted on solar scope. Award coins for hanging on a ribbon.